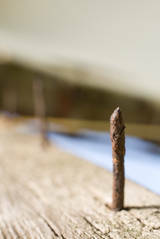 firstly – dont leave wood with rusty nails in it on your plot! bang the nails in or take them out! make sure your tetanus jab is up to date – the tetanus germ lives in the soil, especially manured soil and can enter the body through a small scratch or thorn prick. Known as “lockjaw” it’s a very serious illness, potentially fatal. wear eye protectors when strimming, and put yoghurt pots or other visible (and less spiky) protectors on the end of canes – a stone or a poke in the eye is not fun! bend your knees not your back! Not long before my rusty nail incident, my other half (while being a complete gentleman and offering to spare me some heavy lifting) pulled a muscle in his back and was off gardening duties for a couple of weeks. If you have a lot of digging to do – break it up into one or two hour chunks. Many is the time, as a site rep, I have seen an eager new gardener transform a plot in a full day of manic digging – never to be seen again after several weeks of back pain I presume! keep your mobile phone on your person. Not nice to think about – but you are working late one evening and there is no-one else around – come accident or threatening youths, a phone might make all the difference! take care with power tools – sharp blades which can cut through tree branches will make easy work of your limbs! Follow the instructions, wear protective clothing where necessary, ensure you are properly trained in their use and don’t work with power tools when drunk or tired – it could cost you life or limb!